Volunteers gathered over 900,000 certified signatures on recall petitions—far more than the required 540,000. Wisconsin Governor Scott Walker will be the first chief executive of an American state to face a recall election because he attacked the rights of working people to have a voice in their workplaces and in the public life of the land. The Wisconsin Government Accountability Board on Friday morning certified more than 900,000 signatures on recall petitions to remove the anti-labor governor—far in excess of the required 540,000. They also certified more than 800,000 signatures to remove his lieutenant governor. And four of Walker’s key legislative allies, including the powerful majority leader of the state Senate, will also be forced to face the voters. The accomplishment of the grassroots campaign to recall and remove Walker and his allies is dramatic. And the confirmation of that accomplishment marked "a historic day in democracy for the state of Wisconsin,” according to Wisconsin AFL-CIO president Phil Neuenfeldt. The accomplishment is, as well, unprecedented. Two American governors have been recalled and removed in American history—in North Dakota in 1921, in California in 2003. Individual legislators have also been recalled and removed. But there has never been an instance where recall elections could on the same day remove a chief executive and flip control of a legislative chamber from one party to the other. That’s the prospect that Wisconsin faces on an electoral timeline that was formally set Friday morning by the GAB. “Today’s announcement from the Government Accountability Board represents another milestone in the battle to reclaim Wisconsin values. While this news comes as little surprise, it does serve as vindication to those that worked tirelessly throughout the petition campaign—a campaign that collected over 1.7 million signatures, and stands as the largest recall in United States history," read a message from the United Wisconsin movement, which spearheaded the recall drive. Unlike in some other states, the Wisconsin recall provision—as written by the progressive reformers of a century ago—does not take the form of a referendum on whether officials should continue in office. Rather, it forces a whole new election, with partisan primaries and a general-election final. Candidates will begin circulating petitions this weekend to gain ballot positions. In instances where more than one candidate files for a party nomination, primaries will be held May 8. The winners of those primaries will face one another in the June 5 general election. The Wisconsin political field is very much in play. Walker is running for reelection, as is Lieutenant Governor Rebeccas Kleefisch. Democrat challengers have announced in both contests, with former Dane County Executive Kathleen Falk gaining substantial labor backing in her run for the party’s gubernatorial nod. Secretary of State Doug La Follette, Wisconsin’s longest serving statewide official, is also running, as is state Senator Kathleen Vinehout, a rural populist who was one of the fourteen Democratic senators who left the state Capitol in order to block action on Walker’s anti-labor proposals. And, on Friday afternoon, following the certification of the petitions, Milwaukee Mayor Tom Barrett, the party’s 2010 gubernatorial nominee, entered the Democratic race. Walker could well face a Republican party primary challenge, although he remains a favorite of the right-wing base that has come to dominate the once-moderate party. There are likely to be primaries for the office of lieutenant governor and the state Senate seats as well—as the Republican Party of Wisconsin has indicated that it will file fraudulent candidates (so-called "placeholders") in all Democratic primaries. While much of the media focus will be on the partisan jockeying, it is important to keep track of the reality of what has happened in Wisconsin. An American governor sought to impose a radical austerity agenda that attacked labor rights, public education and public services—while cutting taxes for multinational corporations. The people of that state filled the streets and occupied the capitol to object. The governor and his allies refused to listen to the people; they enacted the anti-labor law—portions of which were, on Friday, found by a federal judge to be unconstitutional. 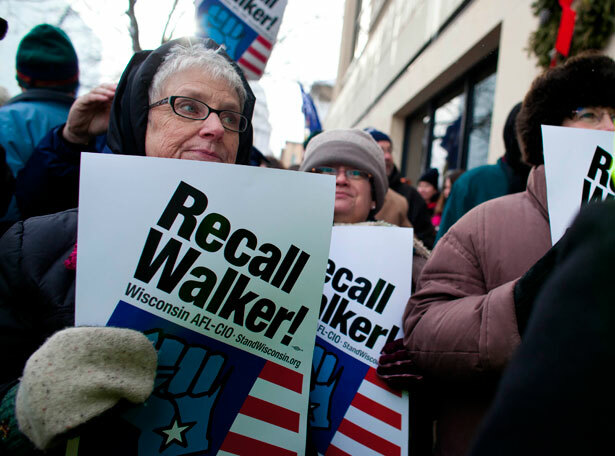 In the face of Walker’s extreme moves, the people dusted off an old progressive tool of accountability—the recall power— organized the grassroots United Wisconsin movement that attracted 30,000 volunteers. The governor pushed back with a multi-million dollar television advertising campaign that attacked the legitimacy of the recall and urged Wisconsinites to oppose it. His allies in the media portrayed the recall as inappropriate, unnecessary and costly. His political backers claimed that the recall effort was collecting fraudulent signatures and suggested, again and again, that it would not stand up to scrutiny. On January 17, that movement filed close to two million signatures on petitions seeking the recall of the governor, lieutenant governor and four powerful state senators. Now, a little over two months later, the petitions have not just been judged to be credible. They have been found to have a dramatically fewer flawed or fraudulent signatures than have historically been found on recall and referendum petitions. Specifically, the GAB found that, of 931,053 signatures filed to recall the governor, 900,939 were valid. Of 842,854 signatures originally filed against Kleefisch, 808,990 were found to be valid. In each case, the totals were dramatically above the required—360,000 more than was needed for the gubernatorial race, 268,000 more that was needed for the lieutenant governor race. "Despite intimidation, threats, and near obsession by our opponents to diminish and slander this movement, these results prove yet again their failure in stifling the voice of working people. This report underscores the just how clean and ethical this historic campaign was," explained United Wisconsin leaders. "Those 30,000 volunteers who sacrificed their time to restore our democracy made sure they followed the rules and acted with the utmost respect for the process, leading to only a meager four signatures marked as fake." John Nichols’s new book on protests and politics is Uprising: How Wisconsin Renewed the Politics of Protest, from Madison to Wall Street, just out from Nation Books. Follow John Nichols on Twitter @NicholsUprising.